The Mandator Award – Stephanie Gorman - “Bottles and cans go there. Cardboard goes here. And newspapers go into that basket. These are the instructions I received at an early age,” says Stephanie Gorman, who is the registered environmental health specialist for the Pequannock Health Department. Now all grown up and fully aware of the importance of sustaining a healthy environment and the legal mandate to recycle, Stephanie is “very proud to work for a town that has built such a strong recycling program for its residents, businesses and schools.” “Stephanie never says it can’t be done. Whether it’s a request to investigate a generator who put mandated recyclable materials into the trash, visiting schools to conduct recycling inspections, creating curbside violation notices, or agreeing to speak about enforcement at a recycling coordinators’ meeting, Stephanie responds with an enthusiastic ‘Yes!’ It is a pleasure to work with her,” affirms Chris Vidal, MCMUA assistant recycling specialist. Litter Bugs Me! Award – Dennis Kearns - In the children’s book titled The Wartville Wizard, written and illustrated by Don Madden, the protagonist who is known as the Wartville Wizard yells, “The people of Wartville are slobs!” Once upon a time, East Hanover resident Dennis Kearns undoubtedly wanted to yell similarly about some of the people who drove along the section of New Road south of Interstate Route 280, incorporating portions of both East Hanover and Parsippany. As he drove to work each morning, he saw the roadside strewn with all sorts of litter and he thought, “Someone should do something about this messy situation” (one East Hanover resident said the roadside was frequently blanketed with paper, plastic bags, long strips of plastic, various types of containers, and campaign signs–the latter following elections). 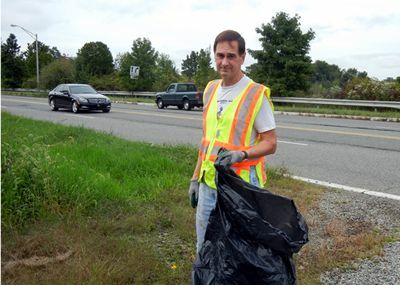 Three years ago, Dennis became that “someone.” Ever since then, he’s picked up litter and put it into plastic garbage bags, which the East Hanover Department of Public Works collects. The biggest piece of litter Dennis ever picked up was the roof of a car that appeared to have been lying in the brush for quite some time; his efforts forced the snakes that lived underneath it to find a new home! Needless to say, the Wartville Wizard would be delighted to meet a volunteer of Dennis’s caliber. 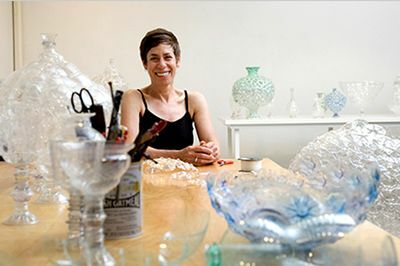 Slice of Recycling Award – Shari Mendelson - This is artist Shari Mendelson’s reflection on the materials used for her artwork: “For the past few years I have been using recycled plastic bottles to create sculptures that reference ancient art. As I move through my daily activities, I am constantly scanning the sidewalks and trash bins for a piece of valuable material such as a blue Evian or Volvic bottle to use in my work. Life has become a constant treasure hunt, and my budget for purchasing art materials has been reduced to almost nothing. While I may not be using enough plastic to make a dent in our environmental problems, I feel good knowing that at least I am not contributing to the problem.” And this is part of what interviewer Penelope Green wrote in “Talking With Shari Mendelson, Who Turns Plastic Bottles Into Art” (The New York Times, June 24, 2010): “Shari Mendelson, an artist in Williamsburg, Brooklyn, makes iridescent vessels that recall Roman and other ancient glass objects. They are bubbly and precious-looking, and Ms. Mendelson fashions them out of plastic bottles that she harvests from the trash, slices with metal-working shears, and hot-glues back together.” Surely the Wartville Wizard would give kudos to Shari for turning litter into treasure. Teaching By Example Award – Phil Infantolino - “And gladly wolde he lerne, and gladly teche” (Geoffrey Chaucer, The Canterbury Tales, c. 1387). Chaucer’s sentiments written so very long ago, definitely apply in 2011 to Phil Infantolino, supervisor of buildings and grounds in the Florham Park Public School District. 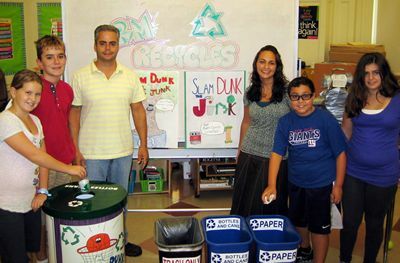 Phil has learned and continues to learn much about recycling, which has evolved into his connecting the dots in order to host an exemplary recycling program in the school district. 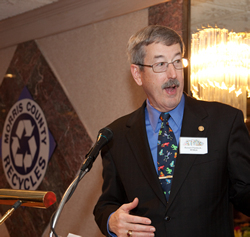 He has worked assiduously with the Borough of Florham Park and the MCMUA to enhance recycling in the schools. He purchased and then labeled containers for recyclables and made sure they were placed right next to wastebaskets or garbage cans. He arranged to have assembly programs presented in all three schools; the focus of these programs was recycling and litter abatement. 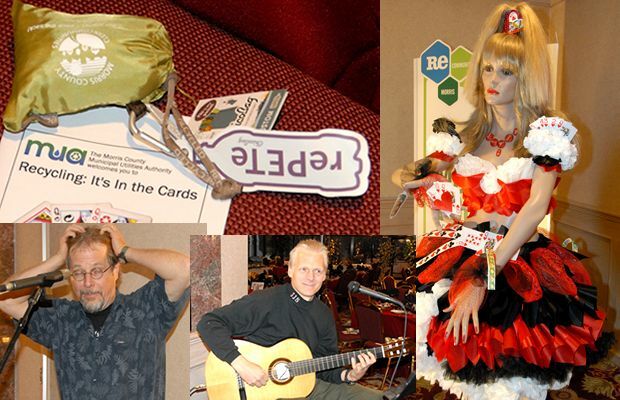 He included the topic of recycling in the first district-wide faculty meeting held during the 2010-2011 academic year. Currently, Phil is in the process of ordering more recycling containers to be used on the athletic fields and in other outdoor areas on school property. “I’m especially delighted to see the children taking pride in putting items into the proper containers. And I’m very excited to report that the growth of the recycling program has resulted in a 30% reduction in our garbage bill,” Phil says. 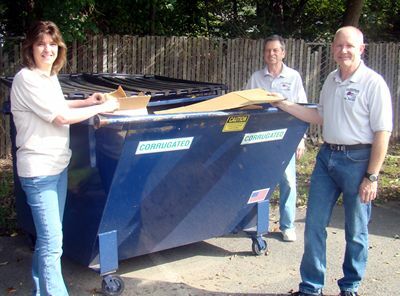 Recycling – It’s in the Card Catalogue Award Parsippany-Troy Hills Library, Main Branch - “Many times I’ve observed custodians reaching into trash cans to remove recyclables and put them where they belong. All of this was done without my saying a word to anyone at the library. It’s very refreshing to see such willingness to comply without any meddling from the Township of Parsippany,” remarks Greg Pavlic, Parsippany’s recycling enforcement coordinator, about what he has seen at the main branch of the library. Indeed, recycling is alive and well at all three branches. A staff recycling committee meets to discuss ideas for the workplace; children’s librarians provide recycled materials for their young clients to use in crafts or science projects; the information services department sponsors free programs to encourage adults to think about recycling, environmental justice, and downsizing; the Friends of the library, a volunteer organization, has established a “Book Nook” at the Parsippany Community Center, where the public can donate and purchase used books. Library Director Jayne Beline lauds the maintenance staff for going “above and beyond to make recycling a top priority,” and she compliments Janet Porsche, administrative assistant, for helping to set up a system with recycling bins for paper, bottles and cans. “I am so very proud of them,” Jayne declares. Presentation of the Maraziti, Falcon & Healey Environmental Excellence Scholarship to Nicole Gomez - Just one of Nicole Gomez’s activities is volunteering at the Grow It Green Community Gardens on the premises of Lafayette Learning Center in the Morris School District, where she’s really been in touch with the outdoor environment. 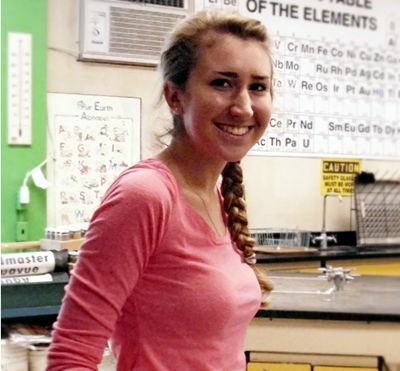 Ever since completing the Advanced Placement (AP) Environmental Science and Field Ecology courses at Morristown High School, she has made serious efforts to reduce her “carbon footprint” by creating less waste, using less energy, recycling as much as possible, and purchasing locally grown fruit and vegetables. Paris Pallis, Nicole’s AP science teacher, describes her as one with a high level of intellectual development, creativity and enthusiasm. Of particular note is the fact that Nicole has been willing to help her peers understand some of the particularly difficult lessons and thereby complete their assignments accurately. “It is not often that a teacher receives such valuable assistance from a student,” remarks Pallis. “Also, Nicole has a fearless attitude toward knowledge. She loves the challenge of figuring things out and always questions conventional ideas. If she has trouble with something, she strives to understand why, makes appropriate corrections, and moves forward. Nicole is confident, polite, and a complete joy to work with,” she adds. RXcycling Award – Bayer HealthCare Pharmaceuticals, Inc. - The Bayer HealthCare Pharmaceuticals, Inc., facility located in Montville has the perfect prescription for a healthy recycling program. The RX is to recycle all of the materials mandated by Morris County and Montville, and top those off with a stellar composting program that includes the following items: plants and flowers (without pots); napkins and paper towels; coffee grounds, filters and tea bags; cold cups, straws, and flatware made from corn; pizza boxes; takeout containers, and food scraps. “Their goal is a zero-waste cafeteria. This is phenomenal!” exults Adam Brewer, Montville recycling coordinator. In June 2009, Bayer implemented single-stream recycling for paper, bottles and cans, along with composting. The compostable material is delivered to the Wilmington Organic Recycling Center in Delaware, where it’s made into compost that is purchased by landscapers, nurseries and garden centers. “We are very proud of our accomplishments to reduce waste and increase recycling and composting at our Montville site. We would not have been successful without the commitment of our employees. Recycling has become a key component of our commitment to sustainability at Bayer,” according to Dawn Inzalaco-Freeman, health, environment and safety specialist. Between June and December 2009, 19.7 tons of single-stream material and 15.1 tons of compostable material were recycled. In 2010, 77 tons of single-stream and 37.5 tons of compostables were recycled. What a prescription! Doing It Right – Jumbo Size Award – Wharton Costco - The Wharton Costco, like all Costco stores, sells everything from soup to nuts (literally) in jumbo-sized packages or in multi-packs. 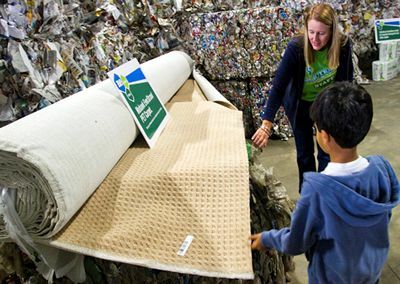 When it comes to recycling, the Wharton store has a large-sized recycling program. The in-store pharmacy captures and recycles about one 30-gallon bag of #2 high-density polyethylene plastic bottles every day. The pharmacy also keeps paper and plastic bottles with sensitive information printed on them separate from other materials and sends them to a company that recycles them “securely.” Paper, bottles, and cans generated elsewhere in the store are recycled in single-stream fashion. 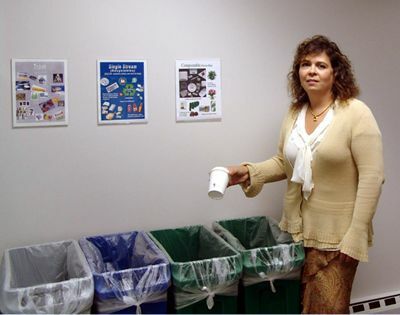 In the employees’ break room there are properly labeled containers with posters above them featuring photos of the recyclable materials or trash that should be put into them. Reusable plates and flatware have replaced disposables. In another area, employees remove all packaging from organics (fruit, vegetables) that are past their prime. They put the organics into a hopper. 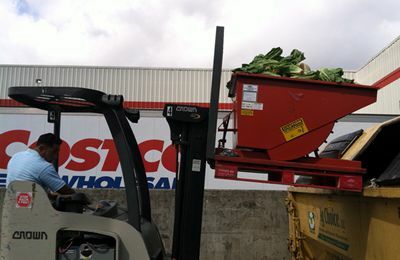 When that hopper is full, a forklift operator moves it outside and dumps the contents into a roll-off container. Then the roll-off goes to Ag Choice in Andover, N.J. “I am very fortunate to work with a group of people who share the same concerns I have about our resources. I am very proud of their commitment to our recycling program and all of their support and effort that have made it a success,” comments Michelle Cavett, the Wharton Costco general manager. Recycling – One Can Award ReCommunity Recycling, Inc. - For 15 years, FCR accepted and processed recyclable bottles and cans in a building located at 103 Iron Mountain Road in Mine Hill. In 2011, the pumpkin turned into a coach, for FCR became known as ReCommunity Recycling, Inc., and expanded its operations to include the building at 105 Iron Mountain Road where single-stream processing equipment was installed. As a result, ReCommunity began to accept an array of materials in addition to bottles and cans: aluminum foil products, a variety of plastics (including rigid plastics), aseptic packaging such as that for soup, soy milk and juice, frozen food cartons, gable top cartons for milk and juice, and all kinds of paper. The days of accepting and processing only bottles and cans came to a halt as abruptly as Cinderella’s coach turned back into a pumpkin at the stroke of midnight. “We’re excited that ReCommunity in Mine Hill is the first single-stream materials recovery facility in Morris County. This venture will generate more revenue and avoid costs for the county, as well as create new green jobs. ReCommunity is a company with a purpose. We exist to extract as much value as we can from the waste stream and convert it to a new form that we call ‘recovered resources’ that can generate revenue as new products. Our ultimate goal is to recover all reusable waste and send only non-value-creating materials to landfills. That’s what my team and I live for. We believe that so much more can be done, and we’re committed to that mission across the country and here in Morris County,” says Sean P. Duffy, president and chief operating officer of ReCommunity Recycling, Inc.
Lois Mettler and Caroll Saks - The Hy Nadel Creativity Award was established in 2010, in memory of Herman (Hy) Nadel, who was a member of the Morris County Municipal Utilities Authority Board for over 17 years, including six years as chairman and three years as vice chairman. In addition, Hy, who was also known as the Cake Man, baked and decorated 18 sheet cakes for the recycling awards dinners between 1991 and 2008. The first recipient of the Hy Nadel Creativity Award (and it was a surprise for her) was Liz Sweedy, MCMUA designer in residence. Liz has greatly enhanced numerous awards dinners by creating glitzy outfits for the mannequin named Miranda McMua, as well as for some of the fashion show models, and by assembling eye-catching exhibits for the display unit. 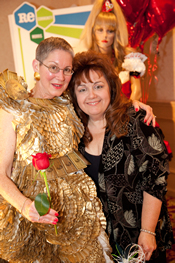 The 2011 recipients are sisters Lois Mettler and Caroll Saks, the dynamic duo called the Peppermint Puppeteers. After more than 30 years of taking their puppet family, led by Superhero Zapman, to over 10,000 shows where they reached two million students, Lois and Caroll have moved on to other adventures. 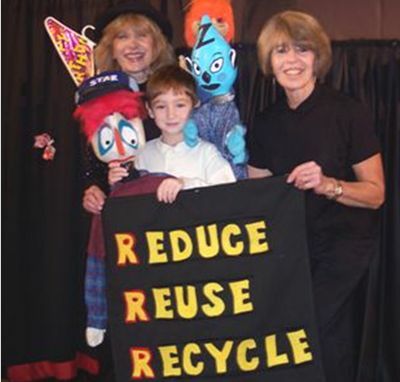 Because they returned to many schools, the duo wrote six different puppet stories highlighting recycling, litter abatement, storm drain protection and conservation. Lois and Caroll say they’re extremely fortunate to have had a career that was so much fun and so rewarding. One of their goals was to make the garbage story interesting and entertaining, and they did it with great passion, style, and pizzazz. Earlier this semester, County College of Morris Assistant Professor Kelly Whalen asked her fashion design students to participate in a garment competition for the MCMUA. Their task was to create garments that incorporated reused, recycled or “found” materials. Kelly said that “the fashion program has implemented the muse of Alexander McQueen this semester in many of the studio assignments, and some students chose to incorporate this into their projects. Others were inspired by the materials or a particular time period.” She was very impressed by the enthusiasm and creativity which emanated from the designers. The names of the six designers and five models (one designer is modeling her own garment) follow: Anthony Antignani (Samantha Cardona, model); Andrea Bravo (Katie Hopkins, model); Nikki Kircher (Madison Kircher, model); Alexandra Luciano (Gabriella Rossy, model); Nikki Jo Russo (Teresa Collina, model); and Ananda van den Steen. Leeza Tea Coco Chanel, MCMUA designer in residence and the mother of a CCM student, has gussied up a vintage evening gown with sample American Express Gold Cards, photocopies of those cards, and a coffee filter ruffle. All of this is to pay homage to Lizzy Gardiner, who wore a dress made of 171 American Express Gold Cards to the 1995 Academy Awards ceremony where she won an Oscar for best costume design for The Adventures of Priscilla, Queen of the Desert. By the way, Priscilla is currently on Broadway, and the costumes are awesome! Once again, Miranda McMua’s getup is the brainchild of Leeza Tea Coco Chanel. The Queen of Hearts is attired in a skirt and top made from 100% biodegradable wood pulp ribbon fabric, coffee filters, used playing cards, metal bottle caps, and plastic net bags that were once used for onions. “Impact the planet–pack the sack!” is the message for everyone who now possesses a rePete™ Chico Bag®. This handy 99% recycled bag has its very own pouch and a carabiner, so it can be fastened onto a belt or a belt loop. Goodbye, disposable plastic bags, and hello, reusable bags! For the 17th consecutive year, Shot of Redemption is providing live music. To book them for an event, call 845-255-3177. Call2Recycle® collection boxes for rechargeable batteries and cell phones (available to non-residential entities only): www.call2recycle.org. To find the closest Call2Recycle® drop-off location, call 877-273-2925, or visit the website. Morris Habitat for Humanity ReStore, a discount building supply outlet where shoppers will find new and gently used items from windows, doors, appliances and lumber to kitchens and home furnishings. 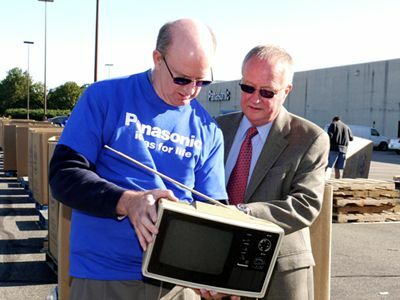 Items are donated to ReStore from both homeowners and businesses with excess inventory. The ReStore is open to the public and is your source for everything you need to renovate, beautify and improve your home or office: www.morrisrestore.org. If You Care® cotton flock-lined household gloves made from Forest Stewardship Council (FSC)-certified latex (the natural rubber is sourced from a responsibly managed plantation): www.ifyoucare.com. Architec™ EcoSmart cutting boards made from 100% recycled food grade plastic and flax husk: available at Bed, Bath & Beyond and elsewhere. Green Street™ serving utensils made from recycled plastic water bottles: www.greenstreet.com. Lily Bloom handbags created from KARMA BLOOM™ signature fabric that is made from recycled plastic bottles: www.lilybloomdesign.com. Go Green mail tote bags featuring artwork from the 2011 Go Green stamp release: www.shopusps.com. Available at your local post office. Totally Bamboo® kitchen accessories (bamboo is “one of the world’s most renewable resources”): www.totally/bamboo.com. Recycled decorative bas-relief items made from recycled aluminum: The Forge at Gatlinburg in Gatlinburg, TN. E-mail: christopheramoore0302@gmail.com. 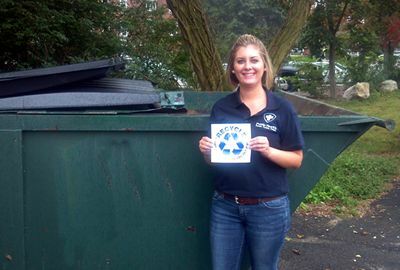 Information about the MCMUA single-stream recycling program: www.MCMUA.com, or call 973-285-8389.